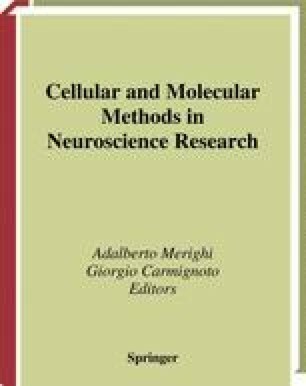 This chapter describes confocal and electron microscopic methods for tracking peptide ligands and/or their receptors following their internalization in cell cultures or brain slices. The confocal microscopic techniques are based upon the use of high affinity fluorescent ligands that were originally developed in our laboratory to study the fate of internalized neurotensin (NT), somatostatin (SRIF), and opioid peptides (9,13,17). The electron microscopic techniques are adapted from the pre-embedding immunogold method developed by Virginia Pickel and her team (5) as applied by us to study the effect of ligand exposure on the subcellular distribution of various subtypes of neuropeptide receptors.